Litigation is very much akin to a team sport that requires the thoughtful dedication and attention of both the lawyer and client. With this in mind, Mr. Chason believes in collectively defining goals based upon the client’s needs, the applicable law, and the facts at issue. Once those goals are established, Mr. Chason works hard to help the client achieve them in the most efficient and effective way. Aside from legal expertise and experience, Mr. Chason also brings to the practice of law key life experiences which enhance his ability to understand the needs of his clients. While completing his education, he spent summers working for large general contractors, plumbing contractors and foresters, giving him a knowledge of construction and forestry issues, to the benefit of those he represents. A native of Bay Minette and a lifelong resident of Baldwin County, Mr. Chason is well-acquainted with the people and the economic and political dynamics of the area. 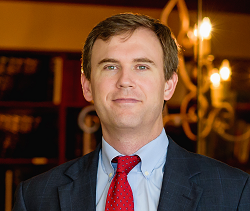 Mr. Chason’s diverse practice has covered the litigation field to include representing both plaintiffs and defendants in personal injury cases, property disputes, premises liability cases, maritime cases, construction cases, breach of contract cases, and even the occasional trip to bankruptcy court. Having been exposed to a broad area of the law is an advantage. In addition, he is currently pursuing BP claims on behalf of businesses arising out of the 2010 Deepwater Horizon oil spill. Represented a local hospital against a bed manufacturer and service agent and obtained a $1,015,592.36 judgment in favor of client. The case involved an indemnity agreement, warranties, and product liability claims, as well as complicated medical issues. Represented a Alabama-based trucking company in a breach of contract dispute against one of the leading heavy truck and motor manufacturers in North America, obtaining a $1,245,348.00 judgment for the trucking company. After losing on appeal, the manufacturer paid the judgment, plus interest. Represented a local tug and barge operator against a shipyard and obtained a $250,000 settlement in favor of client based on claims that the shipyard engaged in illegal dredging activities and violated client’s riparian rights. Represented general contractors sued as a result of installing Chinese Drywall and obtained favorable settlements. Represented an individual in a premises liability action based on building code violations and obtained a $201,000 judgment in favor of client. Represented a family in a heated dispute with neighbors concerning easement rights, trespass, and riparian rights. Obtained a $250,000 judgment in favor of clients, which included $50,000 in compensatory damages and $200,000 in punitive damages. Represented auto manufacturer BMW in a products liability case brought by the owner of the BMW who was injured in a car accident. The owner claimed that the airbags failed and the vehicle did not protect her during the accident. Obtained a defense verdict for BMW. Tried a jury trial seeking to nullify the Last Will & Testament of the decedent based on lack of mental capacity. Obtained a large settlement on behalf of an individual against a pharmacy which mis-filled the client’s prescription. Drafted articles of incorporation and operating agreements for clients.